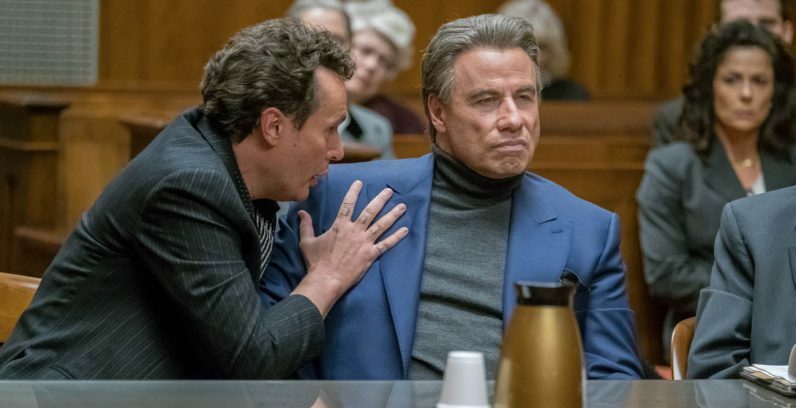 NEW YORK (CNS) — Aficionados of stilted dialogue in low-budget crime sagas will likely find much to savor in “Gotti” (Vertical Entertainment). Those not eagerly forming a queue at the cliche buffet might nonetheless enjoy John Travolta as the late mobster John Gotti, his face set in a purse-lipped scowl, chest puffed out, not so much walking as strutting, and ready to slap or shoot at a second’s notice. The story line, unburdened by any form of tension, doesn’t show how Gotti’s many criminal activities in the New York City boroughs — racketeering, loan sharking, drug trafficking and so on — operated. Other than the occasional murder — his first was in 1973 — he might as well be any other striver on the corporate ladder, hoping to impress his mentor in the Gambino crime family, Neil Delacroce (Stacy Keach), and earn a promotion. Impatient, he eventually felt the need to have lugubrious Gambino head Paul Castellano (Donald John Volpenhein) whacked during the Christmas season of 1985. This sordid yet theatrical rub-out set in motion his takeover of the syndicate, also giving him a sudden taste for fame and a grip on the public’s imagination. Magazine profiles followed, as did such sobriquets as the Dapper Don for his attire and the Teflon Don for the three acquittals he obtained through witness intimidation. His life after that consists of non-stop pressure from the FBI and police, and the fear of betrayal by wiretapped colleagues and anyone willing to cut a deal with prosecutors. Dying of cancer in prison in 2002, Gotti realizes that his no-compromises approach won’t be passed down to his son. What’s here is too ineptly written and performed to constitute a whitewash of the man. But a reluctance to incorporate any moral viewpoints by any of its characters makes for a weak, poorly seasoned stew. The film contains much gun and physical violence and pervasive rough language. The Catholic News Service classification is A-III — adults. The Motion Picture Association of America rating is R — restricted. Under 17 requires accompanying parent or adult guardian.